That specific post may not be the best example, but I can't seem to find another one at present. I've benefited several times from finding these types of links in SO, and it seems silly to duplicate a lot of what may be a moving target in SO. In fact, since the bug is often still being worked on, copying anything from the bug tracker to the answer on SO runs the risk of being invalidated by further research by the maintainers. So... it seems when the answer to a questions is "It's a bug, here's a link to the tracker", a link-only answer is the best choice. The fact that there is a link in an answer doesn't mean an answer is a link only answer. If you (would) remove the fluff and then the link, and there is nothing left then it is a link only answer. In your example you would be left at least with the statement that this is a bug in MySQL and that would be good to know if you hit it in your program. The only link only answers that I have seen that are appropriate for the questions is when the question is inappropriate and asks for references in the internet. Those are not the kind of questions we want to have here, as they, combined with their answers, are not self-contained. That has nothing to do with the link pointing to relevant and/or useful material. I even have a few links in my browsers bookmarks that I took from link only answers. I think it is wrong to dogmatically follow any policy without trying to understand the reasoning behind it and recognizing there are always exceptions. There are situations where a link is appropriate. The question is specifically about having trouble downloading GitHub and the user is suggesting to directly access the full download link in the browser rather than running the GitHub installer .exe which tries to download that path. The first comment makes absolutely no sense: the link is an application, not a website with content that could be included in the answer. Somebody should have spent more than 2 seconds handling that post. The copypasta groups who just blindly apply specific rules without paying any attention to the context are as much to blame here. I get what you're saying but a link to a bug report isn't a great answer. You can work around this bug by doing Y and Z, until the bug is fixed. While a link to a bug report can be helpful, it doesn't usually solve the asker's real problem. 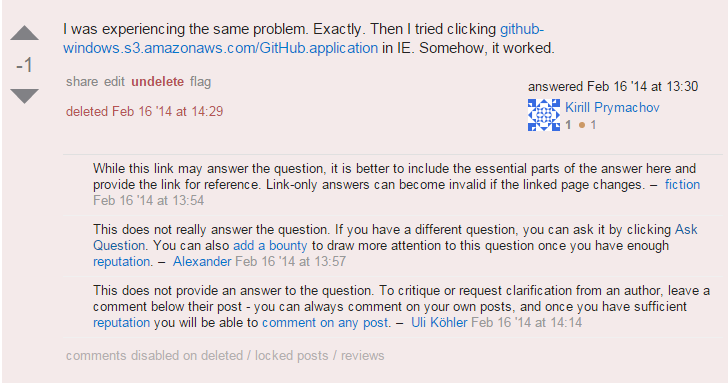 It just leads the asker to ask a followup question about what to do until the bug is fixed. Not the answer you're looking for? Browse other questions tagged discussion not-an-answer link-only-answers . Why do review audits count towards the daily quota? Am I evaluating link-only answers correctly? Are internal link-only answers advisable? Is editing in the relevant parts of a link to a link-only answer acceptable, even preferred? Could answering with the same link-only answer be considered spam?